Great progress on this one. I've reached the top right hand corner, there's a big old Jack O'Lantern next and I've nearly done two pages. There are 6 pages in total. 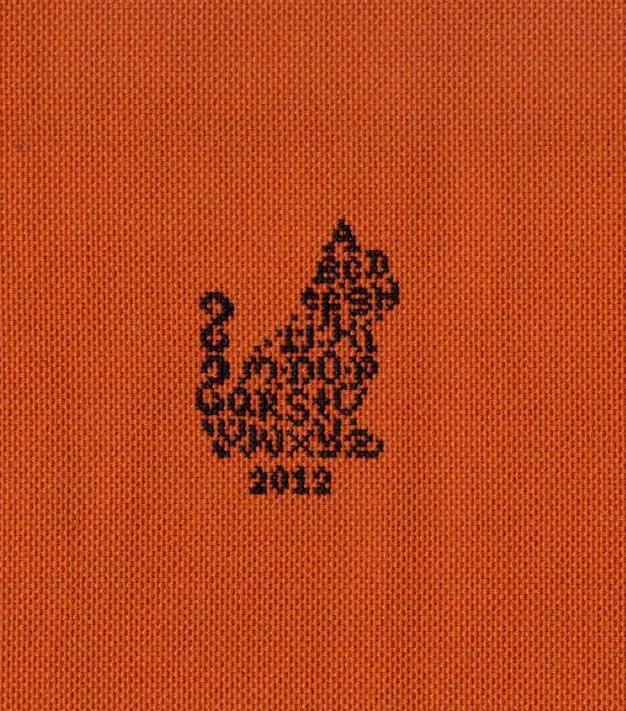 I'm going to stitch until the 31st then put it into my New Year rotation. November's Theme is Nail It November - What's lying around that's so close to being finished you can't stand it anymore? Get to it and finish it! This is a not such a good one for me! I'm not going to finish any of my four main WIPS as I have Round Robins which must take precedence over all other projects. I also have my own project to start for the Large Mira RR starting in 2013. I could always do some "finishing" finishing and sew up an ornie or two I suppose. I could also "nail" my list for my "13 in '13". Finally, the emails have been sent to the participants of the Hallowe'en Blog Hop, if you signed up and haven't got one then let me know. Everyone else can enter the Mystery Phrase Competition starting the 31st October. 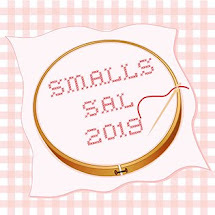 I'm putting a little prize together, it will feature a skein of Glow-in-the-Dark thread and other stuff! That's what's been going on round here lately! As well as RRs flying around and a lovely giveaway prize (which I haven't photographed yet) there were the Birthdays. I stitched two cards for two lovely Birthday bloggers. The first one went to Chiara the Grey Tail (actually the grey tail is her cat!) in Italy. The card grew wings and flew there in only two days. When Chiara saw my card for Kell, "We're not old, we're Retro" she laughed and commented that "my best friends says we won't get old, we'll get vintage.. ;)" Strangely enough I'd been planning that as my next card so I offered to send it to Chiara for her birthday "providing it's not in the next ten days as it won't get there in time". Turns out Chiara's birthday was actually twelve days later!! But she didn't mind me being fashionably late. I stitched this in my usual backstitch and felt pens technique. 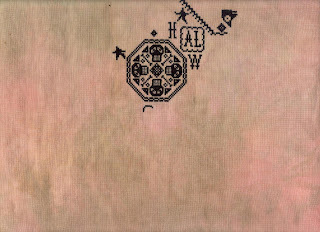 But this time I did the backstitch, then the background colouring, then stitched the floral motifs in the letters. It makes a nice 3D effect. The lace ribbon is a sticker which came with a box intended for my Toddler Group craft table but I decided it was too nice delicate for 2 year olds and kept it! The second card is the next one in the WOCS Flower of the Year series, October Marigold. 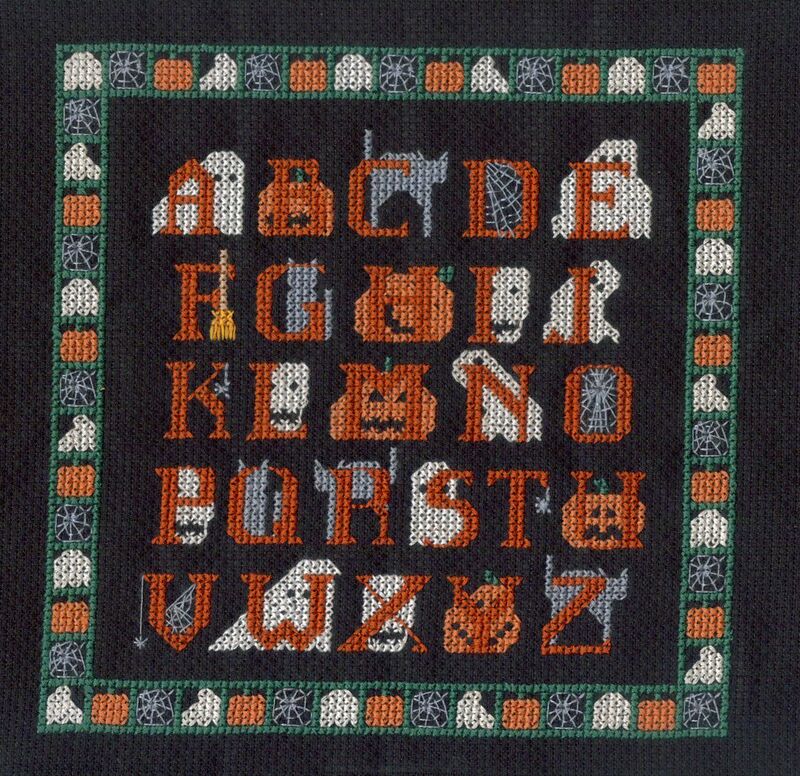 This went to the hilarious Shirlee the Easily Influenced Stitcher. 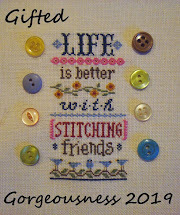 Shirlee is in my Top Two Funniest Bloggers list along with Stewie from the Spinster Stitcher. I won't say who is Numero Uno as the other might be offended LOL. I've nabbed Shirlee's photo because mine came out blurry (camera on the wrong setting?). I made another new Hallowe'en start this week, Just Nan Frightful. 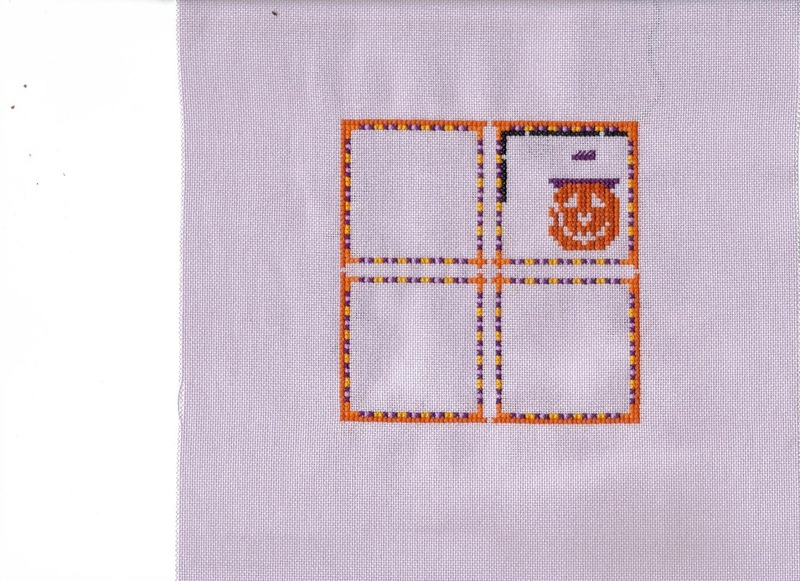 This is stitched on 28count lilac Britney evenweave using the recommended DMC except for the black. I thought I'd try the Sullivans using 2 over 2. It covers quite nicely in the border and didn't knot as much as using 1 over 1. But when I stitched the bat motif it was no better than DMC for coverage so it'll be three strands for the motifs then. I must share the new blog Faith Hope and Charity I found today while looking at another new blog (Hello Sewphie!). 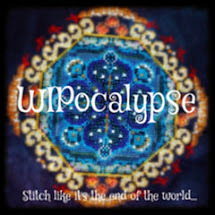 This is not a pure stitching blog but she does do craft, she also does sarcasm and satire on a grand scale! Check out this linked post about Hallowe'en fancy dress then go to the Ebay tab. I challenge you not to laugh out loud and fall off your chair! Finally, the Hallowe'en Blog Hops sign up is closed, I'm emailing the participants next then you'll have to wait until the 31st to join in with the Mystery Phrase Blog Hop Hunt. Here's what gave me a numb bum this weekend. First of all Cat's lovely Four Seasons Round Robin. She stitched four boxes with a central diagonal band across each then we could choose a section to complete. I chose Autumn because I'm an Autumn baby and I loved the colours. What I did not love is the frog that hid under the leaves! I really like satin stitch as a rule but this was a PITA. 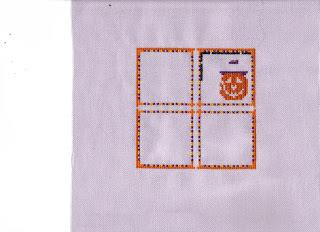 First of all I stitched one segment using the charted 3 strands. That was lumpy, bumpy and not smooth. So I frogged it. Then I used 2 strands which was smooth and lovely to behold. Until I'd stitched all five segments and found they didn't reach the top. 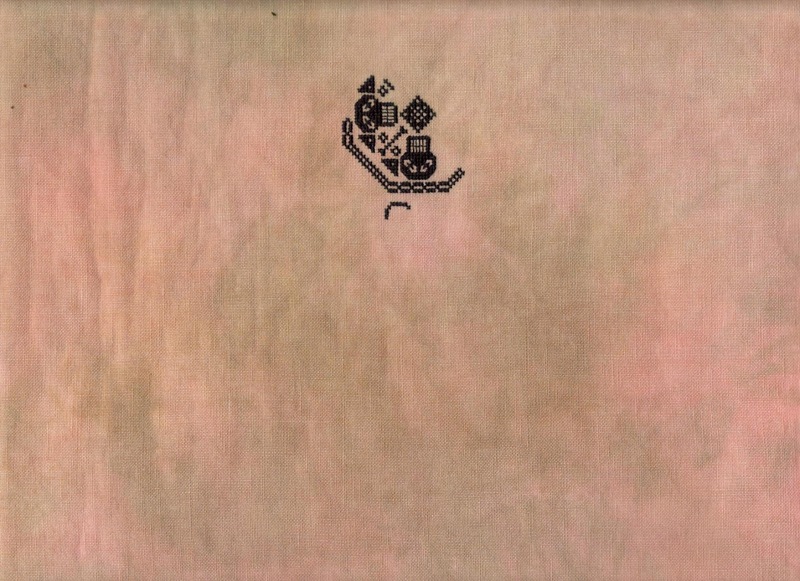 When I looked again and counted and double checked I realised that you need seven stitches to cover six threads on the fabric, the seventh stitch being the outside edge of the block (make sense?). So out it all came again! I re-stitched and now it looks lovely again. The frog has been unceremoniously dumped outside the back door before I mailed the parcel to Sophia a day early. This is worth noting as this RR has been dogged by delays, both postal and personal to the contributors! Yes, it's Glow-in-the-Dark Ghostie Kitty! 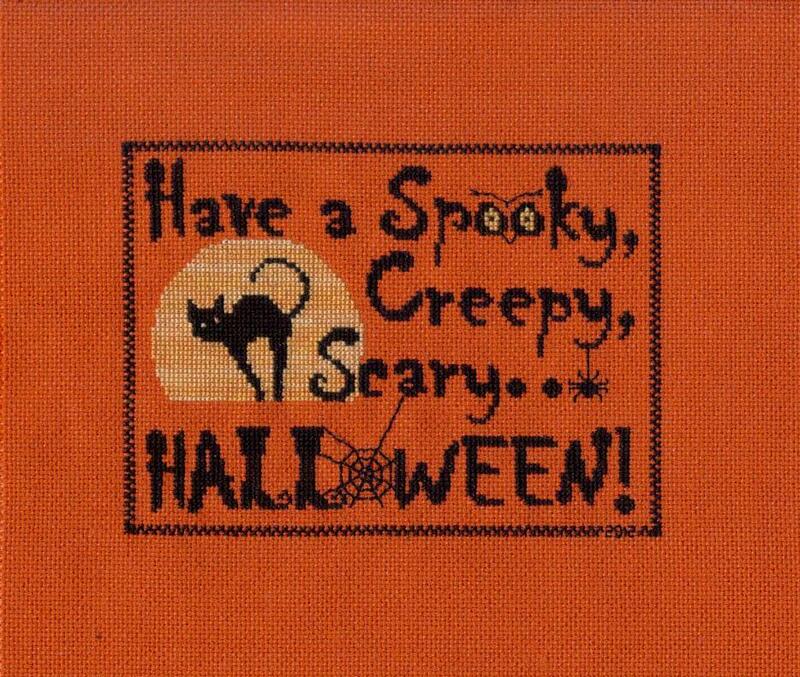 Stitched with Kreinik Glow-in-the-Dark thread. I tried to get the much cheaper DMC version but it was sold out. What a surprise, why didn't I think of buying it not in October? ps do you know how hard it is to photograph in darkness? Answer - very, then you have to photoshop to see the pic at all! I stitched Ghostie Kitty for my son because I'd already stitched these two for someone else and didn't want to stitch a third one. Aren't they just amazing? They have glow-in-the-dark eyes too. Carolyn has charted them from another person's little animation thingies and she's done a great job. Here's a link to her blog, the previous Freaky Freebie post gave the link to her Deviant Art page where you can also find the charts. 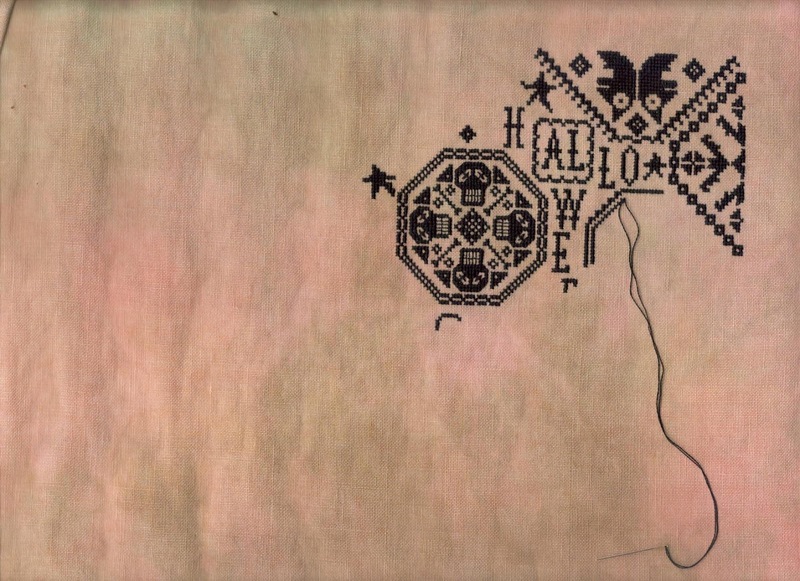 Finally, there's still time to sign up for the Hallowe'en Blog Hop. Click on the tab at the top that says "Hallowe'en Blog Hop" not surprisingly! Sign-ups close this Friday. 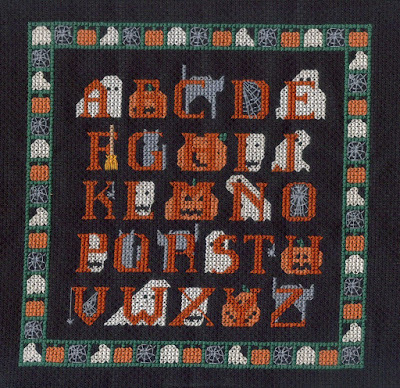 For those of you still deciding whether to join us for the Hallowe'en Blog Hop here's a list of freebie designs I love! Posing here with my three-pages-a-week calendar and my latest WIP. Several people have named it now, it is Prairie Moon Thine is the Trick and the Treat. I'm stitching on some hand-dyed 40count Newcastle linen the lovely Karen sent me. 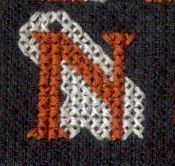 It's an enjoyable stitch because there's a variety of techniques, from the solid black of the shapes, the repetitive borders and the more interesting letters. I can switch from one to the others as I get bored of one type of stitching. Several people have admired the calendar each time I've featured it. It came from a mail order firm called RU Craft and has three charts a week usually on the same theme. Currently Autumn! I haven't seen one for 2013 yet although they are advertising Quilting and Knitting versions. "Wow, the holidays are only a couple months away! Avoid that last-minute crunch and work on some gifts now" I decided to go for pieces I am obliged to work on due to mailing dates; cards and round robins. :-( I gave it a good 6 weeks and emailed it instead. We are both keeping our fingers crossed it will arrive one day, maybe in time for Christmas! I'm still looking for a November Birthday to stitch the November flower for if there's anyone out there celebrating next month? 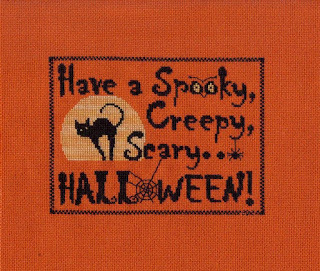 Finally, don't forget my Hallowe'en Blog Hop. Click on the Primitive Needle pic below for more information. 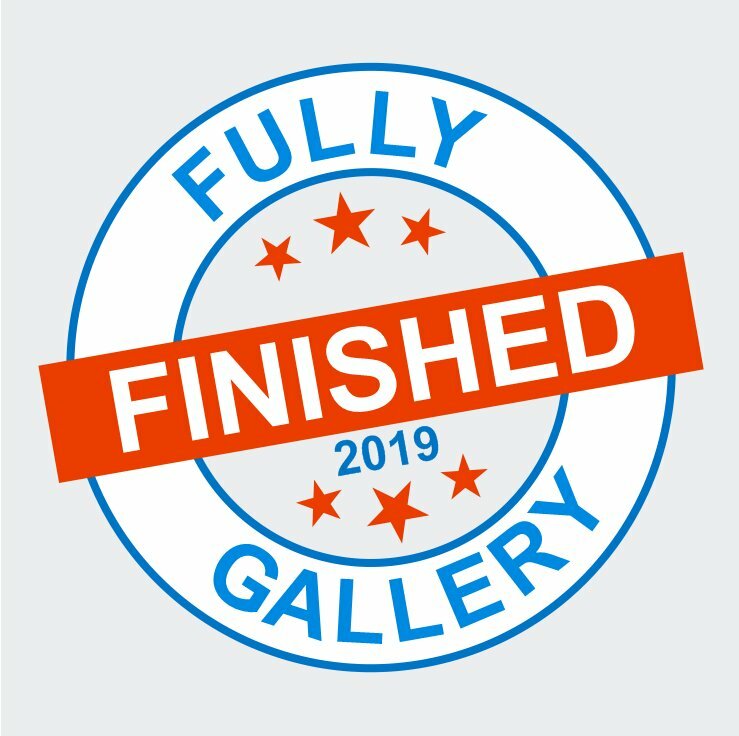 Lots of finishes added to my special finishes blog this week. If you just like to drool over lots of pics and little chat then pop over and Come Happy Dance with Me. And for those you like alot of chat, here are the latest two plus a mystery WIP. First up is the completed Spooky Hallowe'en from Puntini Puntini (sadly no longer available). I love this design and you can finally see the part that made me fall in love with it - the little witchy boots! 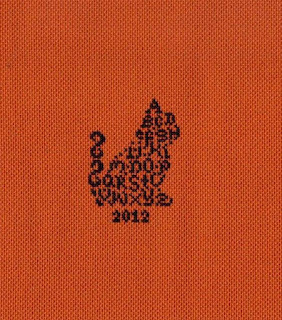 I stitched this over 1 on 28 count Burnt Orange evenweave (jazlyn or jobelan) using Sullivans black and GAST Harvest Moon. It took exactly a fortnight! There are so many cute details besides the little boots - the owl eyes, the spider and it's web. 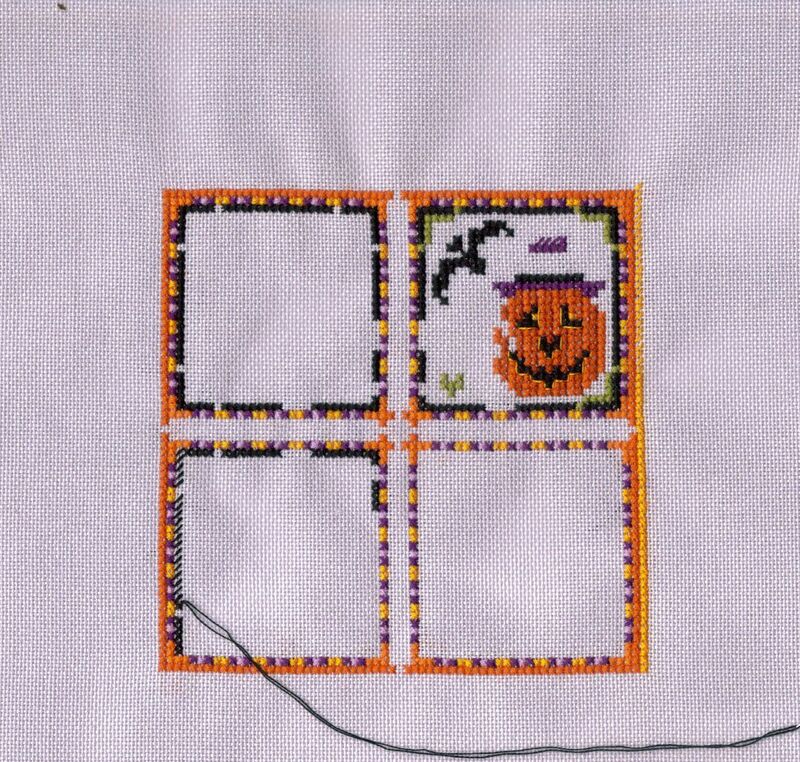 I'm going to finish it tomorrow, maybe as a flat ornie using the bat fabric Sarah sent me and adding a Hallowe'en charm. We had a very intense and long-awaited-for 90 minute paediatrician's appointment on Thursday and I was so drained afterwards I needed to chill out so I started and finished this little cat in one afternoon flat! Stitched on the same 28 count again over 1. I changed the "meow" to 2012. I know this was in the Hallowe'en issue but TBH it would be lovely for any season, in green and red for Christmas, pink for Valentine's etc. So don't be surprised to see him again! Here's the WIP, any ideas now? Giovanna knows because she has it in her stash and Evalina knows because she's stitching it too! Stitched using 2 strands of 310 over 2 on 40 count linen. Nice dense finish! Finally, I really need some more people for the Hallowe'en Blog Hop on the 31st or the mystery phrase will be "Boo" and not much of a hop! If you're concerned about your ability to post on the 31st because you'll be out on your broomstick then remember you can schedule a post to be published anytime. Just ask how! Click on the picture below to see how to sign up and what you have to do (post a picture basically! ).